Today I can't wait for you to meet Krista from Goodwill Glam. I think I came across her blog when one of her fun table settings with her Blue Willow dishes caught my eye, and I've been hooked ever since! Krista is all about achieving a high $$ look with a low $$ budget, and the things she finds thrifting are amazing! Hello everyone! I'm Krista from Goodwill Glam, where I blog about living a glamorous life on a Goodwill budget! I share everything from decor and design ideas, diy projects and outfit ideas and hopefully inspire people and help them feel like they can do it too! I'm so excited that Jennifer asked me to be here today! I've been a long time fan of her blog and her style! Although I secured my blog about two years ago, I've only really been blogging for about a year. I'm probably the newbie here, so I'm really excited to be among such amazing bloggers! I love the idea Jennifer came up with, asking us to share our "Favorite Five" because it inspired me to sit down and really think through all my projects of the last year. My most recent favorite post is our Dining Room Reveal. I joined the One Room Challenge and redid our dining room in six weeks, using mostly thrifted finds. It was a crazy ride and stressful at times, but I love the final product and the room looks so much more "finished" now! If you get a chance, check out the before and after, the difference is HUGE! 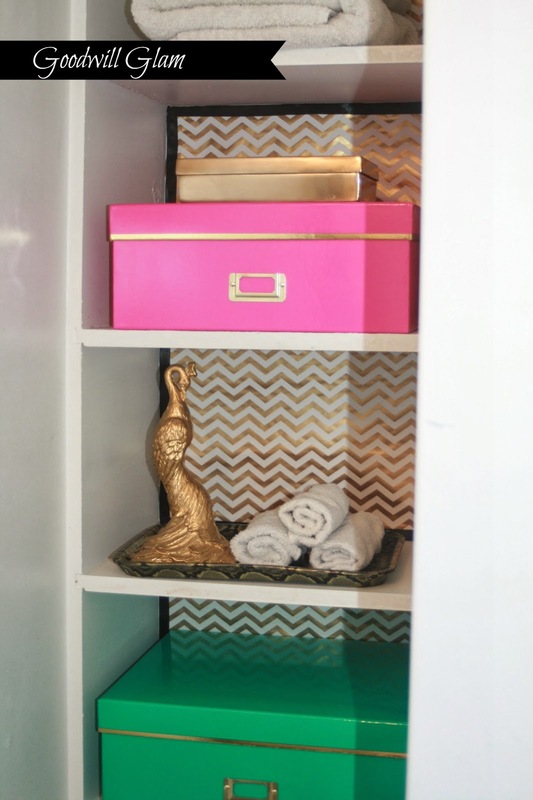 Another project I loved doing is our Closet Makeover. It was such an awkward, little space and I neglected it for far too long. Sometimes the littlest projects can make a big difference in your life! Sometimes, a little DIY goes a long way! I recreated Nate Berkus' Gold Ikat Bowl and fell in love with it! I also shared a step by step guide along with this post in case anyone else might like to make one for themselves! I have a thing for Kate Spade. I'm drawn to her style and love just about everything she does! 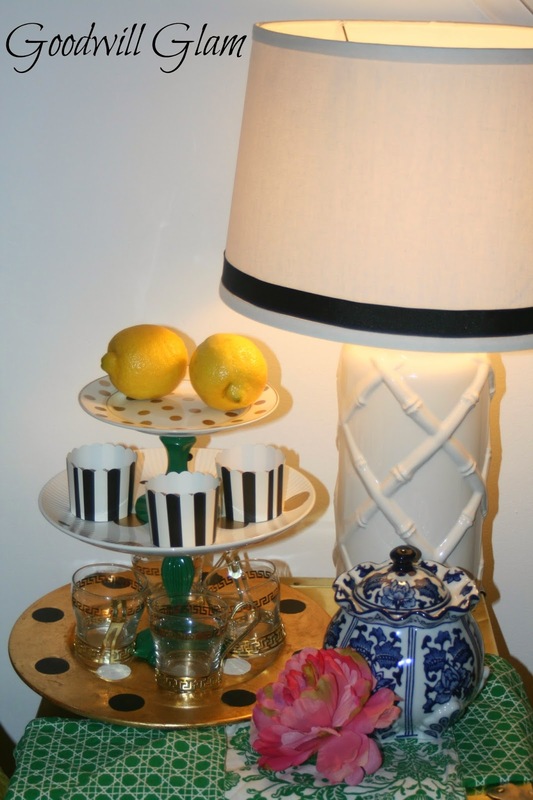 A few months ago, I decided to see if I could make something that was inspired by her using only thrift store finds and came up with a Kate Spade Inspired Three Tier Tray. Again, what I love about it is that it is a little, inexpensive project with a big impact! I also share a tutorial for this one as well. I share a LOT of furniture makeovers on the blog. A LOT. I can't seem to say no to old furniture begging for new life. There should really be some sort of support group for this...I haven't found one yet. One of my all time favorite furniture makeovers is my Roadkill Desk. Aptly named because we found it on the side of the road intended for the garbage. It was a HOT MESS. It has become one of the most used items in our home and in a few weeks, I'll be sharing a follow up story. I hope you'll check back in for that! Jennifer, thank you so much for inviting me today! I'm so excited to meet some new friends, I hope you'll all come visit me soon! Those are some of my favorite projects from Krista too! Can you even get over that DIY ikat bowl??? Love it! 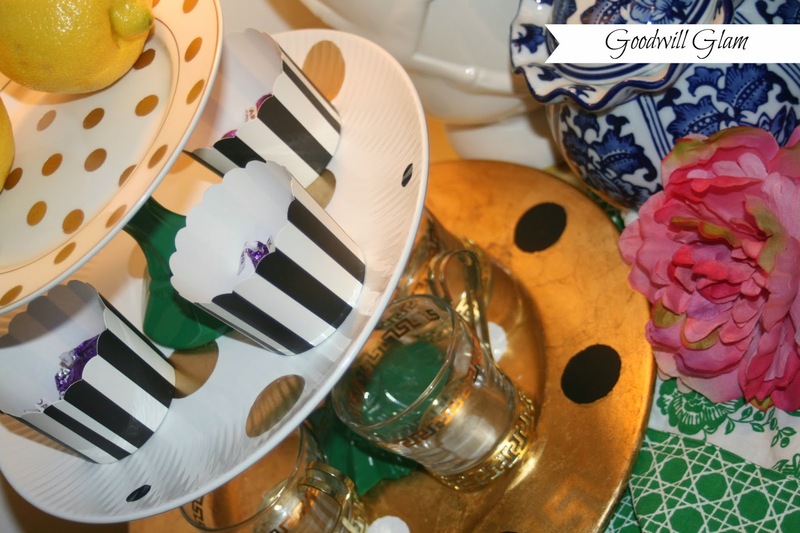 Check out Goodwill Glam, here's the table setting that hooked me on Krista's style and some of the incredible pieces that she brings back to life. I'll have another guest on Friday, but the next two days I'll have some regular (hint hint-are you ready for the Jackie Kennedy inspired link-up for the Summer Style Soiree?) posts for you. We've started the trek home, so if you live in Virginia or Tennessee, I'll wave to you as we drive by! What a beautiful desk! You always have the greatest and most creative ideas Krista! Krista!! Another one of my new-to-me blogs this year - I love your projects, so creative and fun!! You blow me away with your thrifty finds!! love her projects! that desk is a favorite! I love following along with all of Krista's fabulous finds, she is SO good! Hi Krista!!! I am a HUGE fan of Kate Spade too! I love the desk - amazing transformation! The ikat bowl! The blue dishes! The greek key desk!! Love them all! Those are some fun projects! 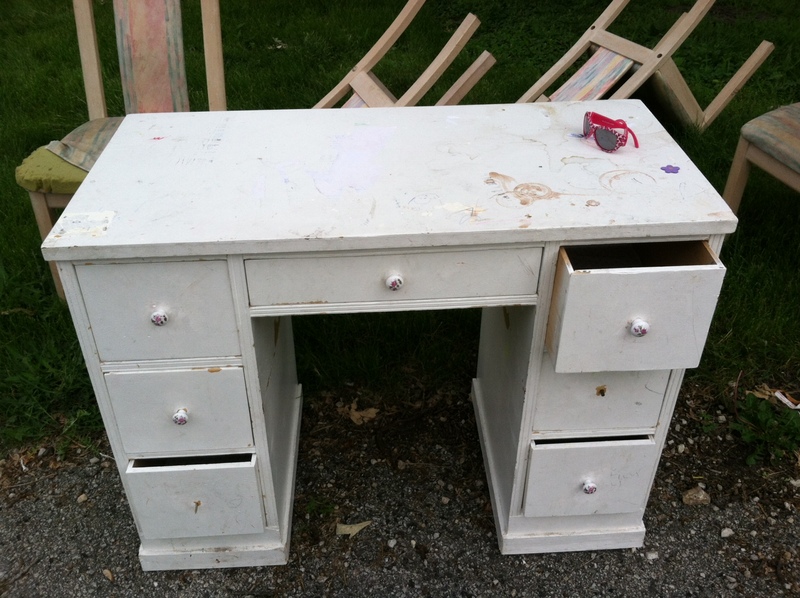 The desk is an amazing transformation- makes me rethink all those roadside treasures I pass up! I followed Krista during the ORC and I love what she did with her dining room! And that desk is to die for! I can't wait to explore her blog more! love that desk, great color! Ooooh! I love this style! I've been clicking through all of the links in this little series! Love what you've put together Jennifer!